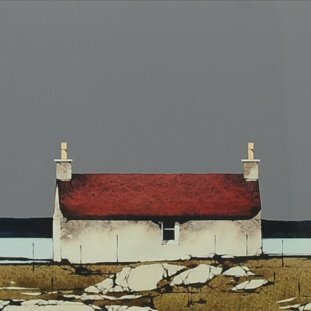 Ron Lawson – Giclee Click an image to see artwork framed. …doodle on any piece of paper I could find. In my early teenage years I began to combine my enjoyment of both films and art by painting my own versions of cinema posters. From these I created a large portfolio which earned me a job at 16 years old in the art studio where I worked happily for the next 34 years. There are many artists I admire. I am impressed by Edward Seago and his use of watercolour. I admire absolutely everything Sir James Guthrie did. 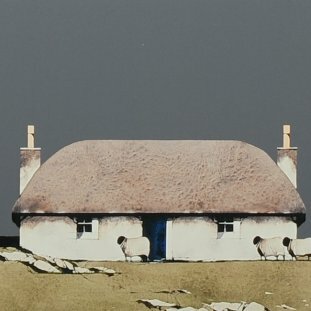 I also hold the works of James Morrison in very high regard; I have one of his paintings in my studio and never tire of looking at it. Before deciding to paint professionally most of my time would be spent training for marathons or cycling. These days I do not have much free time as I work best when I am totally focused. I very much look forward to getting back out on my bike, but serious (painful) cycling can wait a little longer as I now direct all my energy into painting. I thoroughly enjoy travelling all over the Highlands and Islands to capture the amazing landscapes that inspire my work. Whilst each place has its own unique quality, the opportunity to spend several days on St Kilda was truly wonderful. There is so much to see it is impossible to capture everything in one visit, so I enjoy returning regularly. I believe that in order to paint the subject I need to see and experience the places myself, and there are countless places I have yet to discover. I may even take my bicycle.